The most powerful operational rocket on the planet took off from the historic 39A launch pad at the Kennedy Space Centre. It is the same platform that the Moon missions of the Apollo programme were launched from. It then managed to recover for the first time the three Falcon 9 rocket parts that make up the device. 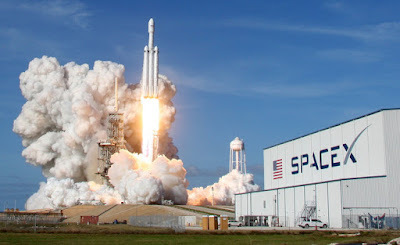 SpaceX launched the 70-meter-high Falcon Heavy, designed to carry more than 64 metric tonnes of cargo, with the Arabsat-6A on board. The modern and innovative satellite, weighing more than 5,900 kilograms, will provide television, radio, internet and mobile communication services throughout Europe, the Middle East and Africa. Q. Which rocket from SpaceX successfully completed its first commercial mission by deploying the communications satellite Arabsat-6A into a geo-synchronous orbit?